“Bourbon and pickle juice, Champagne and fried chicken, peanut butter and bacon: sometimes it’s the odd things in life that go well together. CrossHatch, is proof of that. This low production label is blending incredible, unlikely varietals together that mimic the artistic technique of cross hatching, and it’s wooing all who taste it while keeping the most educated of tasters on their toes. 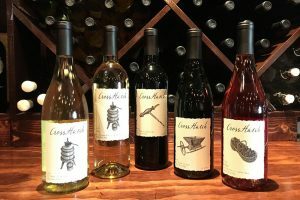 I tasted all five of the label’s blends, starting with Tone, the 79 percent sauvignon blanc and 21 percent chardonnay blend, which grabbed my attention right out of the gate with its incredibly bright mouthfeel and buttery smooth finish. Then I tasted Shape, a non-traditional blending of 80 percent mourvèdre and 20 percent cabernet franc. The sweet scent of strawberries and cream was followed by a deep, lush, hearty vibrant strawberry-tinged rosé that absolutely satisfies. As I dove into the red Rhône- and Bordeaux-style blends, Shading andDepth, my expectations were low, figuring that their winemaker was beginning to get a little too far outside the lines. I’m a big fan of Carr’s Cabernet Franc Reserve and have never felt it needed fixing, futzing or blending in any way. I stand corrected. While I’m still a fan of the cab franc by itself, I must admit the berry notes on Shading, the grenache-syrah blend, practically jumped out of the glass with intense raspberry on the palate and a bit of spice on the nose. Depth, the merlot-cab franc blend, is not to be missed either thanks to its earthy nose, similar to the Cab Franc Reserve, and a velvety smooth, lightly tannic finish. Basically, Carr has taken the best parts of each varietal and mashed them into perfect blends the likes of which I hadn’t thought would ever work well together.